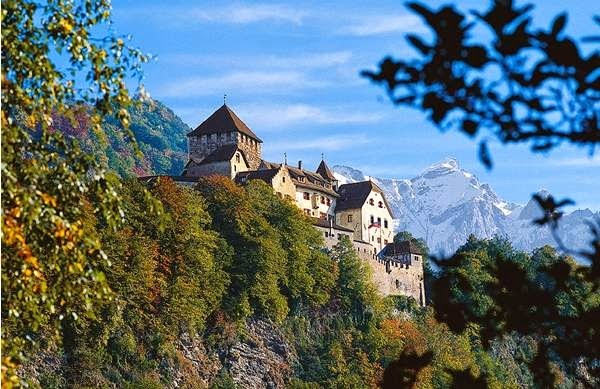 Schloss Vaduz is a medieval castle perched up on a hill about 120 metres above Liechtenstein's capital by the same name. In former times also known as Schloss Hohenliechtenstein, it is owned by the Princely Family who made it their official residence about 65 years ago. 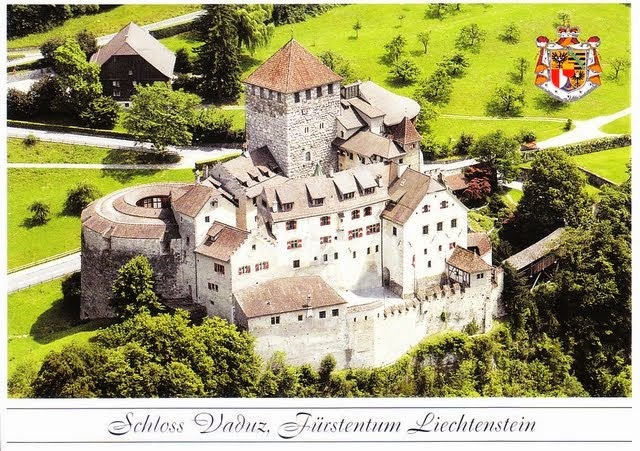 No one knows exactly just how old Liechtenstein's most famous landmark is, but its history surely reaches far back. It is believed that the first parts of the castle were built in the 12th century to replace the destroyed Burg Schalun, the ruin of which is also known as Wildschloss today. The Bergfried, a tall tower typically found in medieval castles in German-speaking countries, is said to be the most ancient part of the castle. Measuring 12 by 13 metres, the walls of the Bergfried are up to four metres thick. The year of construction of the residential tower, which was added a few years afterwards, can be dated to the year 1287 thanks to dendrochronology. In the following decades, more parts were added to the castle. Its original entrance on the courtyard side is eleven metres high. The first presumed owners and thus also builders of Schloss Vaduz were the counts of Werdenberg-Sargans. 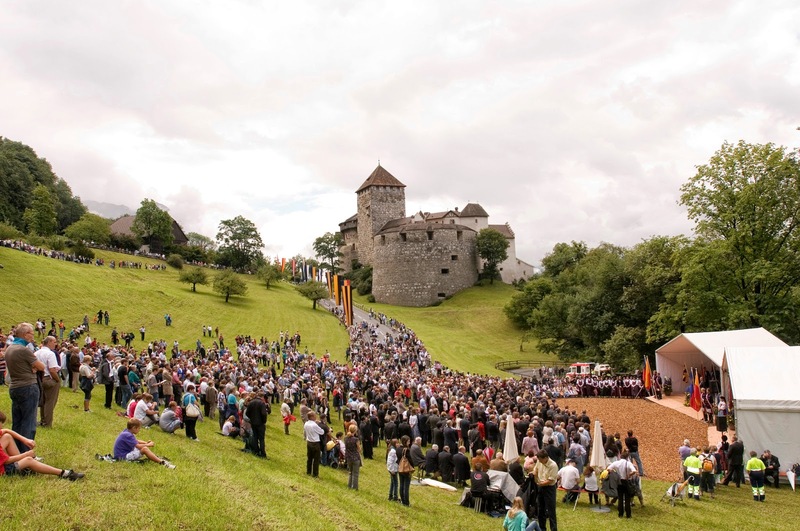 Firstly mentioned in 1322, the castle, its surrounding buildings and the tree gardens as well as the people of Triesen and Vaduz were pledged to Ulrich von Matsch for 400 mark silver that year. In 1338, Ulrich von Montfort received the castle as a retirement cottage - or whatever Leibgedinge exactly means in English - on the agreement of the counts of Werdenberg-Sargans and Count Friedrich V of Toggenburg. A few years later, on 3 May 1342 to be exact, a partition treaty between the sons of Count Rudolf II of Werdenberg-Sargans took effect. His son Hartmann III received the castle above Vaduz and its surroundings as well as a few other neglectable - for the sake of this post at least - properties. His family branch subsequently became known as the Werdenberg-Sargans-Vaduz, as he made the castle his main residence. In July 1396, Wenzeslaus IV - or Wenceslas, or Wenzel, or Václav, depending on which language you prefer - of Bohemia, of the House of Luxembourg - yes, that did exist in medieval times - and German King since 1376, elevated Vaduz, together with the demesne of Schellenberg, to the rank of a county. The likely delight, however, was of short duration as the Werdenberg-Sargans-Vaduz family had to pledge the castle to the barons of Brandis later that same year. When Hartmann IV, the last member of the Vaduz branch, died in 1416, the Brandis' took full possession of the castle. During the Swabian War of 1499, the castle's owner, Ludwig of Brandis, had sided with the wrong side, in this case the Holy Roman Empire, and Swiss troops set fire to the castle which was badly damaged. Even though only provisional repairs had been made, the Brandis family was forced to keep the castle available to Emperor Maximilian I at all times, but already in 1510 Johannes of Brandis sold Schellenberg and Vaduz to his nephew Count Rudolf of Sulz, who had to pay 12,000 gulden plus outstanding debts. It was Count Rudolf who rebuilt the damaged castle with financial help from the Emperor. He also added new parts, most notably two round bastions with walls measuring up to five metres. The entry to the castle still in use today also dates back to the days of Count Rudolf. In 1613, Count Kaspar of Hohenems bought both Vaduz and Schellenberg for 200,000 gulden - quite a rate of price increases I'd say though I certainly am no expert on medieval real estate. It was the Hohenems family who made a few slight changes to the Western façade. By the end of the century, the Hohenems family had run into deep financial trouble. Already in 1699, the Hohenems had sold the demesne of Schellenberg to a certain Prince Hans-Adam I of Liechtenstein. Thirteen years later, Count Jakob Hannibal III of Hohenems also sold Vaduz to the princes of Liechtenstein and thus the castle came into their possession. If you either just checked or still remember - an A+ for you - you know that the princes of Liechtenstein did not bother to visit their principality by the same name for a loooong time. Overloards, so-called Vögte, lived in the castle for a few years and during the French revolution it was plundered by invading French troops. In the following years, the usage the building was diverse to say the least. The castle was used as a vine cellar, as quarters for attendants and as barracks. In 1860, a castle tavern was even opened. At the same time, there were also plans to convert Schloss Hohenliechtenstein, as it was known at the time, into a neo-gothic castle though they were never carried out. Only small renovations were made to the landmark and thus the castle subsequently fell into ruins until Prince Johann II plucked up the courage and a lot of money to make the necessary renovations. Between 1905 and 1912, the castle was thorougly renovated and restored under the supervision of Franz von Wieser of Innsbruck and Alois Gstrein of Brixen. Even though there had been suggestions to give the castle a romantic makeover, it was decided to preserve its original architecture and only small changes were made. For example, the height of the Bergfried was increased by four metres and got a new kind of roof. While the exterior remains that of a medieval castle, the interior is rather modern, or as modern as a royal residence usually is. Even though the Princely Family had started to regularly spent time in the Principality a few years before that, it was Prince Franz Joseph II, father of the current sovereign prince, who made Schloss Vaduz the family's primary residence in 1938 after the Anschluss of Austria. In the following years, he had renovations done to make the castle more homely. Maintenance work has been done ever since; a few years ago, one could spot a construction crane at the castle for a while. Apparently, it is, however, still kind of hard to heat up the rooms in winter; basically what one would expect of a medieval castle. Nevertheless, Schloss Vaduz with its about 130 rooms remains the primary residence of the Princely Family. The castle is divided into different apartments; one of the occupied by the Princely Couple and another one by the Hereditary Princely Couple and their children. Of course there are also official parts used for receptions and such as well as the bureaus of the family. As it is the private property and home of the family, the castle is closed for the public. The closest you will probably ever get to it is on National Day, or Staatsfeiertag as the Liechtensteiners call it. The castle meadow offers the backdrop for the official celebrations and afterwards the family invites everyone who wants to into the castle gardens to mingle with them and have a few drinks.